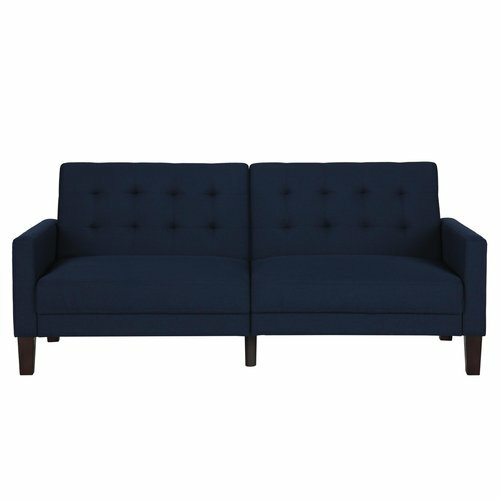 After reading other reviews for this futon I was a bit skeptical, but decided to purchase it as its the perfect color and size for my studio apartment. It has the look and feel of an actual sofa and is long enough for me to lay on without discomfort. I had a few friends over and the three of us sat on the futon to watch a few episodes of our favorite show � no discomfort at all. Personally, I bought it and would suggest it to be used as a seating option rather than a long term sleeping piece. It isnt the fluffiest couch, but the cushioning is a lot better than other futons offered by Walmart and this one has a great aesthetic appeal. It easily converts to a bed which Ill utilize when I have visitors. Seems durable, well made, and definitely looks good for a college-students budget. Home territory searches the web to find the best prices and availability on Futons and related products foir your home like Better Homes and Gardens Porter Fabric Tufted Futon, Multiple Colors. For this page, related items include products we find that match the following keywords: "Futon" at our vendor partner Walmart - Click More Info / Buy Now to check for price rollbacks!. Better Homes and Gardens Porter Fabric Tufted Futon, Multiple Colors is one of 61 Futons and related products available for sale through HomeTerritory.com, If you have any questions on this product, please give us a call at 734-971-1210 during the hours of 9am - 5pm EST for assistance. Thank you for shopping at Home Territory, the home furnishings superstore!